NEW YORK, N.Y. -- Attorney General Barbara D. Underwood and Governor Andrew M. Cuomo today announced a landmark lawsuit against 3M and five other companies to recoup at least $38 million in costs incurred by the State in cleaning up environmental contamination caused by toxic chemicals in their products. The suit alleges that the use of firefighting foams made by the companies at military and civilian airports in Newburgh and New Windsor, Southampton, Plattsburgh, and Rome resulted in extensive contamination of soil, fish, and water by perfluorooctane sulfonic acid/perfluoroctane sulfonate (PFOS) and perfluorooctanoic acid/perflurooctanoate (PFOA). The suit charges that the companies are liable under state law for the contamination caused by their products, based on their conduct manufacturing and marketing products with defective designs, inadequate warning of product dangers, and the creation of a public nuisance. PFOA and PFOS contamination of the environment, and particularly drinking water supplies, is a problem associated with firefighting and firefighting training at and military and civilian airports across the nation. Today's action, filed in Albany Supreme Court, is the first-ever lawsuit brought by a state against the makers of firefighting products containing PFOA and PFOS to recover costs incurred in the cleanup of releases of these dangerous chemicals from airports into the environment. 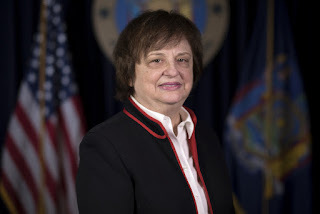 "The conduct of these manufacturers caused widespread contamination of our drinking water and our environment – and jeopardized the health of tens of thousands of New Yorkers," Attorney General Underwood said. "My office will hold these companies accountable for endangering the health of New Yorkers, including forcing them to fully repay the state for cleaning up the toxic mess they created." "As state experts continue to investigate contamination caused by firefighting foams, New York is working to end the dangerous practices that threaten our natural resources," Governor Cuomo said. "By taking necessary legal action against these companies, we are sending a clear message that we will do everything in our power to protect New Yorkers." Today's suit alleges that the use of the companies' products, as intended, at the four military and civilian airports resulted in the release of PFOA and PFOS into the surrounding environment and communities, contaminating drinking water, surface water, soil, and fish. For example, sampling by the New York State Department of Environmental Conservation (DEC) found concentrations of PFOA and PFOS in Lake Washington – a waterbody one mile southeast of Stewart Air Base and Stewart Airport and the primary drinking water supply for the City of Newburgh – as high as 282 parts per trillion (ppt). The federal Environmental Protect Agency's current public health advisory for drinking water recommends that concentrations of PFOA and PFOS, either singularly or combined, not exceed 70 ppt. The toxic chemicals were found by DEC in groundwater at Gabreski Airport, former Plattsburgh Air Force Base, and former Griffiss Air Force Base at concentrations as high as 65,830; 1,045,000; and 61,233 ppt, respectively. DEC Commissioner Basil Seggos said, "When New York's precious natural resources are threatened, the responsible parties must be held accountable and the public should be compensated for the damage. Today's legal action further cements Governor Cuomo's legacy as a national champion for the environment and a fierce protector of public health." Department of Health Commissioner Dr. Howard Zucker said, "Only through our own diligence do we now know that the very products used decades ago to promote public safety, contained chemicals that pose a threat to public health. Today's legal action further cements Governor Cuomo's legacy as a national champion for the environment and a fierce protector of public health." The DEC and the State Department of Health (DOH) have worked and continue to work together to investigate and respond to the PFOA and PFOS contamination released from the four airports. Among other things, DEC or DOH have tested public and private drinking water sources, groundwater, wildlife, and other resources in the surrounding areas for contamination. Consistent with the results, the DOH has issued a "catch and release" advisory to warn people about contaminated fish. DEC has also provided water treatment systems for public or private drinking sources, and bottled water or connections to uncontaminated drinking water sources for several communities. The agencies have also communicated with members of affected communities through public notices, public hearings, and door-to-door home visits when appropriate. DOH also has, when appropriate, offered blood sampling for people living in some affected communities. To date, the state's response to PFOA and PFOS contamination from the four airports has cost an estimated $38,982,200, and these costs are likely to continue to grow. The suit filed today alleges that 3M and the other companies' role in this environmental contamination violated state law, including the marketing of defective products, inadequate warnings of product dangers, and the creation of a public nuisance. The suit asks the court to find the companies liable and require them to reimburse the state for at least the $38,982,200 in costs that it has incurred thus far in cleaning up the contamination. Further, the suit asks the court to award the state punitive damages against the companies in an amount to be determined at trial.